Distance from the beach : 400 mt. Distance from the center : 150 mt. 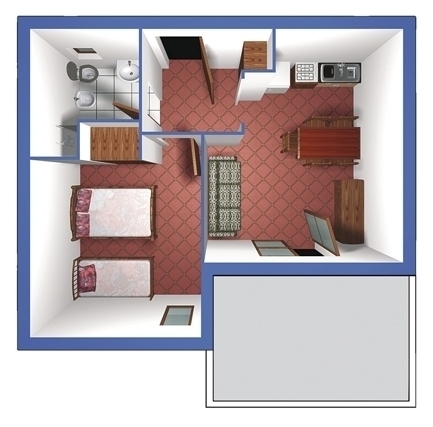 Description : Living room with sofa-bed for 1 person, kitchen, 1 bedroom with 3 beds, bathroom with shower. The weekly prices are in Euro per apartment and include the following services: Electricity, warm and cold water, Agency rights for assistance and BEACH SERVICE starting from the 4th row (1 beach-umbrella + 1 sun chair + 1 sun bed) per apartment. Tourist tax not included in price. Taxes: from two years old € 0,75 for person per night max 10 nights. * Increase of € 8.00 for places near the lane from the 4th row.